Oil shapes our geopolitics and impacts upon the cost of day-to-day living. But what role does oil play within culture? 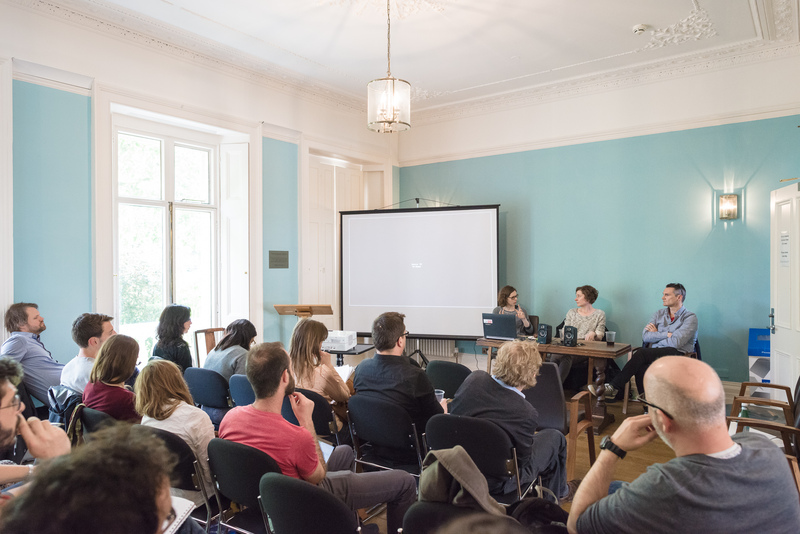 This panel considers literature’s engagement with the oil economy and the opportunities for a participatory democratic citizenship that the cultural critique, and monitoring, of oil affords. In the 21st century, we remain beholden to the oil economy. Oil shapes our geopolitics, our economic forecasts, the global transportation of our commodities, and impacts upon the costs of day-to-day living. Since the invention of the internal combustion engine, the petroleum industry has risen to such prominence that we cannot understand modern capitalism outside of its history as petro-capitalism. And yet, surprisingly, literature has had little to say about the dominance of oil in our lives. The recent emergence of “Petrocultures” as an academic field of enquiry seeks to redress this apparent silence, opening up a space within literary, artistic and cultural production to consider the cultural role that oil plays. How, for instance, is oil depicted in the novel? In what ways can literature imagine a world without oil, where our movements are restricted to the pace of walking? And what opportunities for a more engaged democratic citizenship does the cultural critique of oil afford? This panel will take place as part of Birkbeck's Arts Week 2015. Dr Graeme MacDonald is Associate Professor of English & Comparative Literary Studies at the University of Warwick, and his current research examines petrofiction and resource culture. Dr Jennifer Gabrys is Reader in Sociology at Goldsmiths and Principal Investigator on a European Research Council funded project “Citizen Sensing and Environmental Practice: Assessing Participatory Engagements with Environments through Sensor Technologies,” which investigates citizen participation in monitoring air pollution at fracking sites. Dr Caroline Edwards is Lecturer in Modern & Contemporary Literature at Birkbeck, and her work on science fiction and post-apocalyptic narratives explores the relationship between futurity and scarcity of resources in post-capitalist communities. The panel discussion will be followed by a poetry reading by Michael McKimm from his recent collection, Fossil Sunshine (Worple Press, 2013). Michael’s research in writing this collection was funded by Arts Council England, which allowed him to work with geologists and earth scientists investigating climate change and the oil industry. CLICK HERE to listen to the podcasts of this panel. 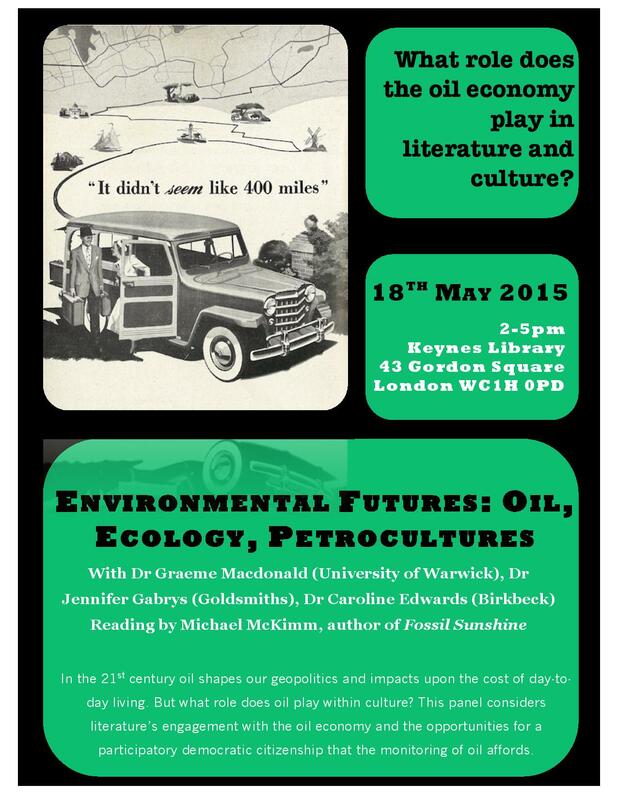 Click here to download the Petrocultures Panel poster, or see below for more information. Featured image by Glenn Euloth under a CC BY-NC-ND license. Poster image by Classic Film under a CC BY-NC license.